If the answer is yes, you may want to consider exploring your options for tooth replacement. Dental implants are a revolutionary tooth replacement option that offers patients natural looking, long lasting results. They are designed to replace the natural tooth root as well as the visible portion of the tooth, making it the complete solution for lost teeth. 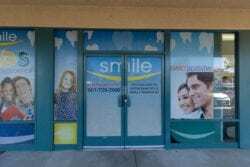 Smile Dental Group offers comprehensive, complete care for the planning and placement of various types of dental implants. Our office is equipped with the latest in dental technology, allowing us to create a more precise and accurate treatment plan that is tailored to your individual needs. From the treatment planning phase to the placement phase, our team works with every step of the way to ensure your restorative needs are met. Receiving dental implants is an effective, safe way to replace one or more missing teeth. Unlike other traditional methods of tooth replacement, implants offer the most well-rounded solution for lost teeth. They replace both the visible portion of the tooth and the tooth root, which is located beneath the gum line. Due to their longevity and appearance, dental implants are the preferred options for patients missing one or more teeth. For children with missing teeth, implants are not typically an ideal solution because their jaws and bones are still developing. Patients in their late teens may be able to receive dental implants to replace their missing or severely damaged teeth. A dental implant is a small titanium screw that is designed to fuse with the jawbone. An implant is comprised of three main parts: the post, the abutment, and the final restoration. Most dentists recommend patients use implants to help secure their final restoration. An implant secured restoration is designed to last longer than traditional restorations, which make it the preferred choice for patients. In theory, implants can be used to secure a dental crown, denture, or dental bridge. The Post: The implant post is constructed using a high-grade titanium material that is designed to safely and effectively fuse into the jaw one. After the post is implanted int the jawbone, it is allowed 3-6 months to fuse into the jawbone fully. The Abutment: The abutment is the connector between the implant post and the final restoration. Typically, the abutment is attached one the post fully fuses into the jawbone. The Final Restoration: The restoration is attached once the post fuses and the abutment is placed. Depending on the number and location of missing teeth your restoration may come in the form of a denture, crown, or dental bridge. To ensure an accurate and precise result, we implement advanced technology for the planning and placing of dental implants. We employ dental technology such as Cone Beam CT Scanning which allows us to gain a comprehensive view of the entire oral system. This technology helps a design a more strategic plan for the placement of implants and eliminate the risk of damage or error. Computer-guided implant placement offers several advantages over more traditional methods. It may even allow patients who are not considered an ideal candidate for dental implants to receive the treatment and yield successful results. Our dental care team will work with you to determine if dental implants are right for your smile. The dental implant process is completed over a series of months. 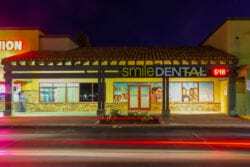 Smile Dental Group has incorporated advanced digital technology for all phases of the dental implants process. We use CT Scanning and 3-D images to gain an all-encompassing view of the teeth, gums, and supporting bone structure. Once a treatment plan is set into place, the surgical portion of the implant process begins. The small titanium post is carefully implanted into the jaw bone. The number of implants you receive will depend on the number and location of missing teeth. Once implants are placed, they are given 3-6 months to integrate into the jawbone. After the surgical implantation phase is complete, the abutment is attached to the implant to help support the final restoration. The next step is the attachment of the restoration. This may be a dental crown, denture, or bridge, depending on the needs of the patient. Missing teeth should be addressed as soon as possible to avoid further complication like additional tooth loss, bone density loss, or infection. At Smile Dental Group we offer a complete range of tooth replacement options that can be tailored to meet your needs. Dental implants offer several key benefits for patients with lost teeth. To determine if implants are right for you, visit our Antelope Valley dentist office. To schedule an appointment, call (661) 463-6530 or request an appointment online.